•Provides fuller coverage and a medium-to-high abrasion resistance. •Expands for ease of installation in either the shop or the field. •Increased braid density coverage provides higher level of abrasion resistance without losing flexibility. •Contains white tracer thread for simple identification of flame retardancy. •Treated yarns extinguish quickly and reduces potential flame spread to surrounding components. •Cuts with ordinary scissors without fraying ends. •Provides fuller coverage and a medium-to-high abrasion resistance. •Expands for ease of installation in either the shop or the field. 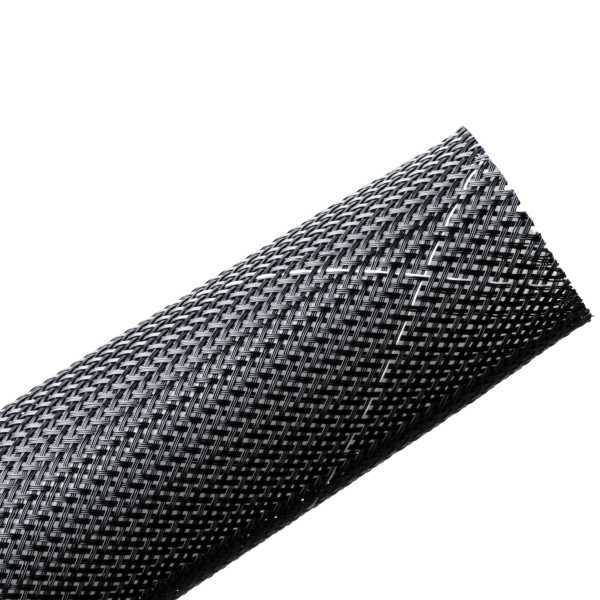 •Increased braid density coverage provides higher level of abrasion resistance without losing flexibility. •Contains white tracer thread for simple identification of flame retardancy. •Treated yarns extinguish quickly and reduces potential flame spread to surrounding components. •Cuts with ordinary scissors without fraying ends. This protective sleeving is self-extinguishing and can be cut with sharp scissors instead of a hot knife for fray-resistant ends. Readily used in the automotive, audiovisual, industrial, wire, cable and computer industries where flame retardancy is required to reduce the likelihood of ignition and/or reduce the rate of flame spread. It is suited for situations where access to a hot knife is either impractical or impossible.